Now that we've introduced the dies for this release, we've got two holiday stamp sets to show. This one uses a boarder strip of solid ovals to create a simple and quick Christmas tree. Love the fonts for the sentiment ... that script is so lovely! The background on this card was made with another border strip from the set, stamped in different shades of green. Love when you can use holiday sets for non-holiday occasions as well. 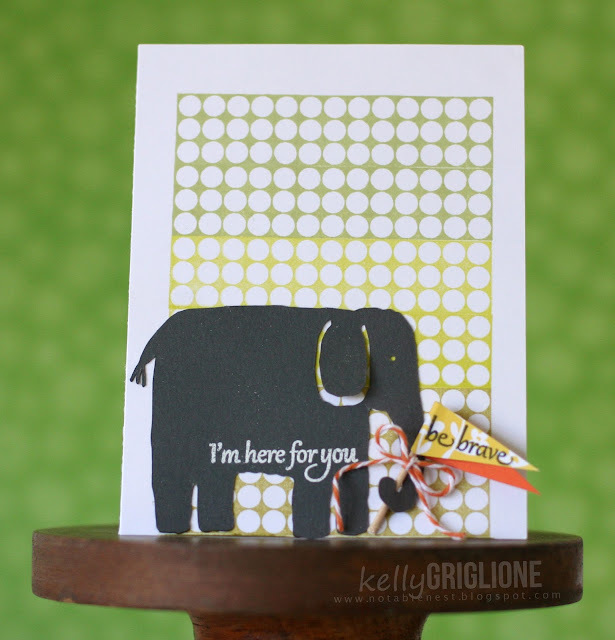 The elephant is from the Silhouette store, and the sentiments are from Calm & Gentle. The orange baker's twine is actually from CAS-ual Fridays Stamps. It's not for sale, but any sets you buy come wrapped so sweetly in blue tissue paper with orange baker's twine. Guess who saves all her packaging?! We'll show the last stamp set tomorrow, and then the release will be available Friday morning. We're mid-way through the July release for CAS-ual Fridays with the last die set. It's a fun oval tag with smaller ovals to nest inside. Love easy projects, and this one definitely qualifies. 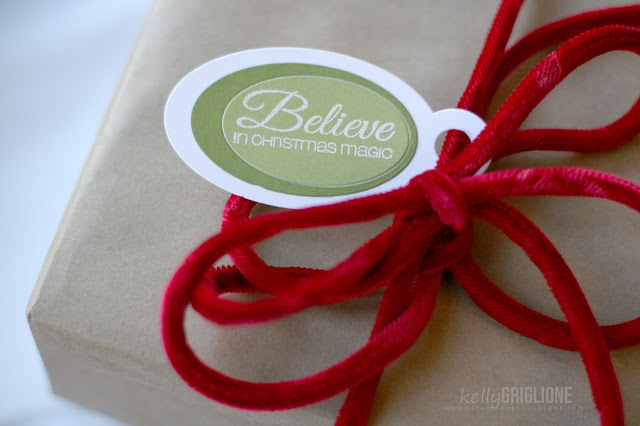 It would take minimal effort to make coordinated gift tags for the holidays. 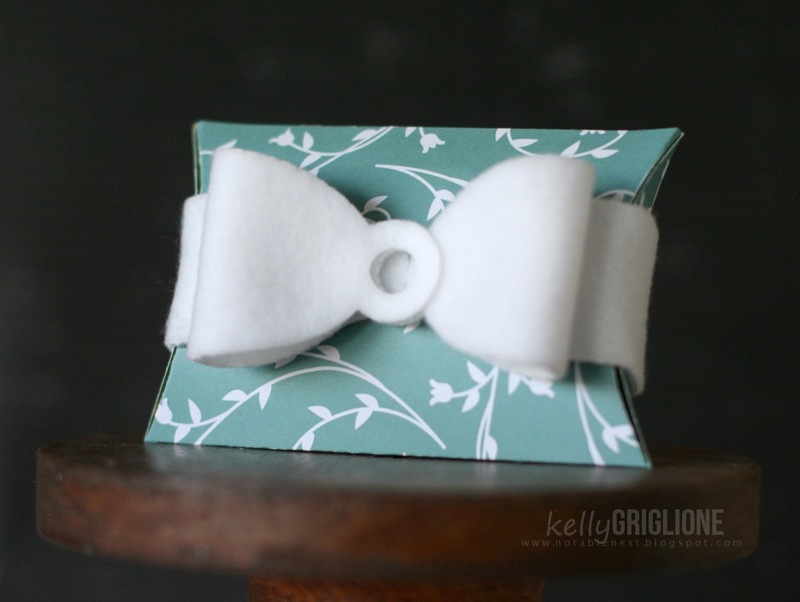 The oval tag also makes for a nice bow! Just bend the oval underneath itself to make one side of the the bow loop, and repeat. Tomorrow we'll be back with one of the stamp sets, and Friday the store will have the new releases. In case you missed it, CAS-ual Fridays Stamps is now offering DIES! 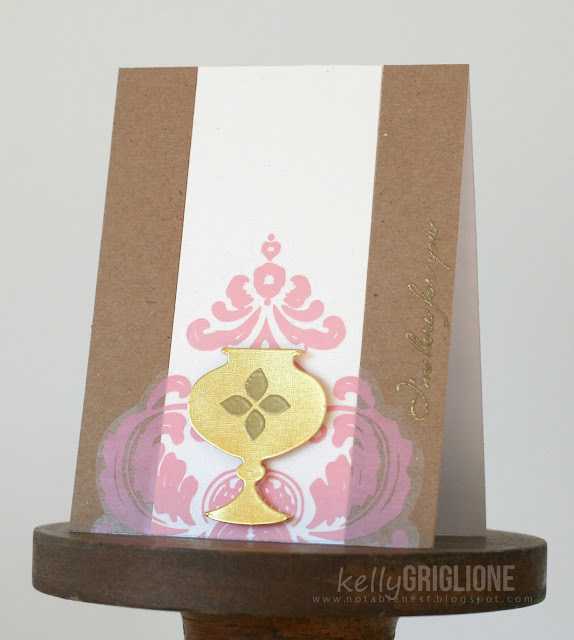 Yesterday I showed some cards with the Loving Bloom Flower Die, and today I have a card using the Bubble Labels Die! These dies also work well for clouds! I used the large and small die to emboss the outline (this can be done by changing your sandwich on the die cutter). Then cut the dies out of printer paper to use as a mask to sponge the sky around. If the panel wasn't popped up, this would be a nice, one-layer card. The tree trunks are from Calm & Gentle, while the "leaves" are from Truth Is. Sentiment is Wonderful Words. Stay tuned for tomorrow when the third die set is announced! Thanks so much for looking. PS. If you haven't heard, my blogging friend Jackie Rockwell is hosting several challenges as she works her way through the Pantone Fashion Colors for Spring 2013. Aside from some wonderful inspiration, you'll also get the chance to win a FREE blog makeover. How cool is that? Something to consider as you're designing cards for other challenges too. Have you heard the exciting news?!? CAS-ual Fridays Stamps is now offering DIES! Seriously, how perfect is that? FRI-DIES! Clever, clever, clever. 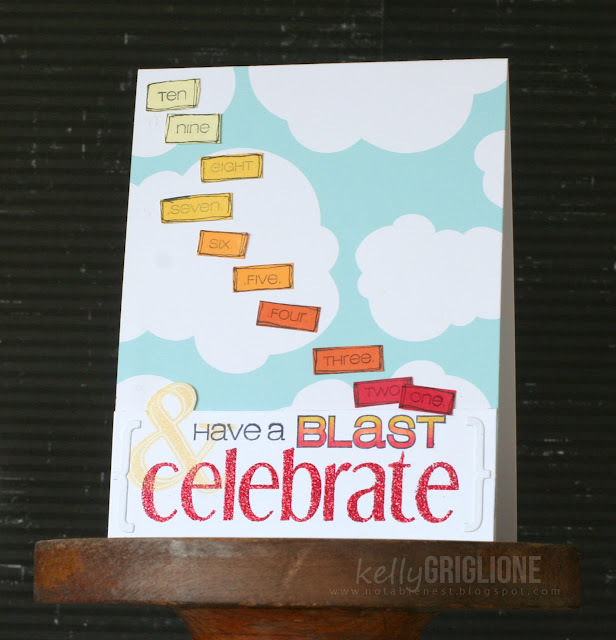 We'll be sharing cards made with the new dies, as well as two new sets, all week. Check back at CAS-ual Fridays Stamps often! Also, be sure to check out who the new team members are, so much inspiration! 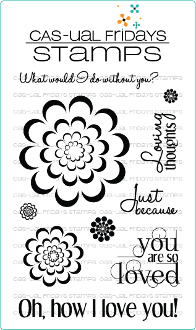 The first is a series of graduated dies that cut out layers of the flower from Loving Thoughts. 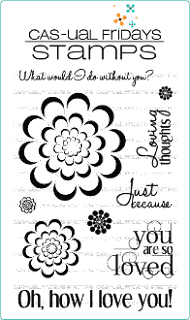 Stamping and embossing the flower first gives a more detailed look. For this flower, spritz the die cuts with water, crumple in your hands, slightly flatten and let dry. It's amazing how well the dried paper holds its shape. The sentiment is from Beanstalks. Not a flower person? No matter, you can use the die to make cookies. Not edible cookies, of course, but ones out of 3 layers of Sonic drink holders! Thanks for looking, everyone! And remember, we've got a whole week of goodies on the blog! A bonus week to get your mojo going ... it's going to be a two week challenge now! 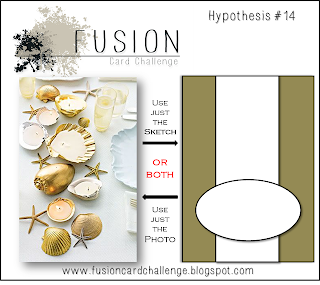 I chose to be inspired by the photo (specifically the dipped gold shells) and sketch. As I was talking to my husband in the doorway of my craft room, my eyes landed on a large roll of stickers I got at a discount store and never used. The pink damask sticker is perfect for the oval element at the bottom of the sketch. I wanted the other colors to be gold (from the photo) and cream/chocolate (from Neapolitan ice cream). Sure hope you'll check out the updated blog/challenge/design team! Thanks so much for looking! ETA: also linking this up to the CASology challenge to use gold on your CAS card. First stop is Jimmy Jamm's Sweet Potato Bakery and Cafe. Yep, everything they serve is made from sweet potatoes! We had the sweet potato pie (yummm), made from the same recipe that's been passed down in their family from the 1930's. Afterwards, we enjoyed a sweet potato grilled cheese sandwich. We were encouraged to come back and try the loaded sweet potato (with meat, veggies, you name it), the sweet potato stew, and the sweet potato ice cream. Everything is made fresh on-site (you can see the open kitchen in the background). 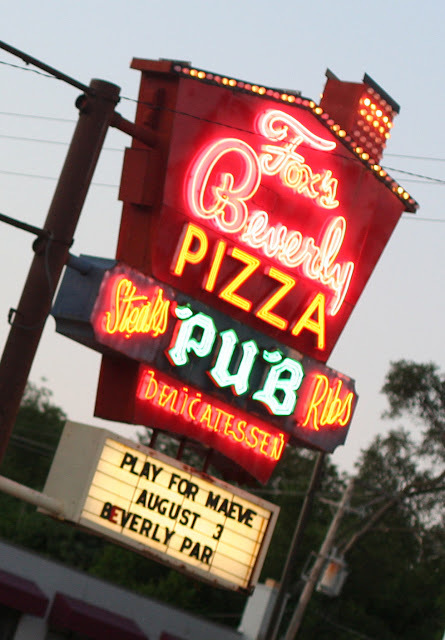 Beverly is a very proud neighborhood with large, established trees and architecturally significant homes, many with plaques showing the architect and the date built. This one is by Frank Lloyd Wright, which may be a tad confusing seeing the stone work facade. At some point an owner "renovated" and covered up the original stucco. Yikes! We met this very friendly and adorable 2 year-old at a neighborhood park, who reeeaaally wanted to take some photos with my camera. She sweet talked me into giving it to her for a little bit. All of her shots were of the ground, as the lens was too heavy for her to hold up! Huh. It's a branch. That grew around and through a fence. And is no longer part of a tree. Cool! I love finding fun details ... like this gargoyle in the roof line of an old house. Or the vintage, stamped bricks edging a garden. Wow, it was wonderful to see so many polka dot entries from last week! This week's challenge proves to be just as fun ... using numbers in your CAS creation. And the winner will receive a free stamp set from CAS-ual Fridays Stamps! I wanted to use the number word strip from the CAS-ual Fridays Countdown set to count down to the sentiment. But I was SO unhappy with the result. It was just so. not. right. Bleah! So I slept on it and crossed my fingers that something better would hit me in the morning. My idea was to stamp on paper that matched the fiery grades of color in the word "blast," draw a box around the numbers, and cut them out. 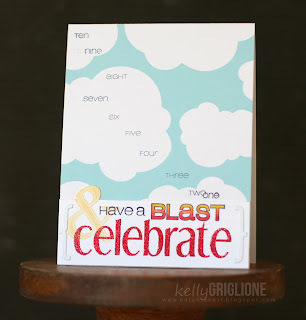 Now they tie in much better to the card, especially since they lead right to the word "blast." Whew, no longer embarrassed to post this card! Also thought I'd share pictures from our city adventure this week. The night before I happened to catch a "top twenty" list of things to do in Chicago, and was interested in #7, the Osaka Garden. Never been there, never even heard of it. So we decided to go check it out. One of the things I love best about our adventures is finding new things in surprising places. I've gone to the Museum of Science and Industry since I was a kid, and had absolutely NO IDEA that it's on a pretty big lake. The entrance is on the north, and the building is so wide that it completely obstructs a huge lake on the south side. I'm sure this feature was used in the 1893 World's Fair that Chicago hosted since there were many canals between the buildings. Side note: The Science and Industry is the only building left from the 1893 World's Fair since all the other 200 buildings were built of stucco, intending to be temporary. This one has a brick base since it was used to house the priceless art exhibits. Anyway, we were all blown away when we came upon the Garden. For the most part, we were the only ones there for two hours. What a gem!! Our activities centered around two main things. The first was following this green heron (on the rock), who let the kids get insanely close to it. The young heron lives on this tiny island in the middle of the garden. If you look closely, you can see it eating the catfish we watched it catch. If you look even closer, on the middle rock you can see a speck of white. That's her egg, just lying out in the open like that! The second activity was fishing. Old school fishing. Macgyver-style fishing. We started out wrapping string that Jackson found around some blades of grass. When the catfish started nibbling at it, we got a little hopeful and put some more effort into trying to catch one. Would you know, it actually worked!! We caught the huge momma catfish! There was so much noise and commotion from our sheer disbelief that it actually worked, that the creepy guy never once moved from his spot on the bridge for all my fish pictures of Logan. Bummer. Then they all wanted a turn to fish and made a line behind Logan. Who knew three bodies could fit on that tiny rock? The kids are needing some beach time in this heat. But first we walk to Promontory Point and check out the sculptures ("talk, talk, smile" is this triangular mesh sculpture). And the view, holy smokes!! It was designed by the same Alfred Caldwell that designed the Lily Pool from last week's adventure. 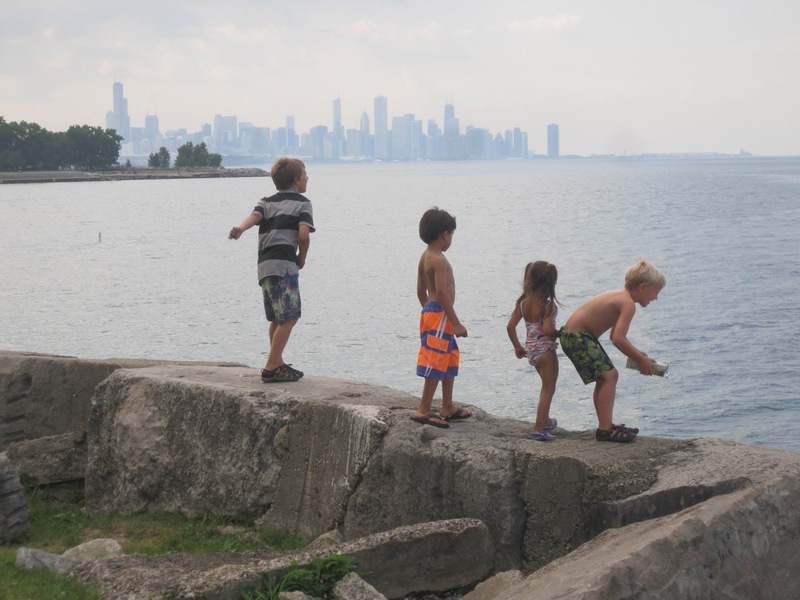 The South Side of Chicago is typically thought of as blue-collar and often a bit scary, but man, the skyline views simply cannot be beat. No self respecting adventurer would be stopped by a little rain. Luckily, especially since we hadn't gotten to the beach yet, it only lasted 10 minutes. The only picture of me ... in the long shadows of late afternoon. So in love with the glowing sun and the crazy clouds. How refreshing when your kids are interested in doing something you did as a child! Make a wish, and make it a good one. Dinner is at Medici (blue sign on the building) where I had been earlier during a tour of Hyde Park. It's one of Obama's favorite places to go when he comes back to Chicago. My turkey/cranberry/nut/brie sandwich is wonderful! They even have a fresh bakery and ice cream shop next door. We saw them making bread for the next day in the back. And ordered ice cream. Dark chocolate is perfect for imitation facial hair, you know. Just because it's 10:00 pm doesn't mean it's time to go home, especially when there's a fountain across the street on a 90 degree evening. It will be another half hour before we pack them up and head back home. Well you made it, tour's over! Thanks for stopping by and sharing in our weekly adventure! First Birthday ... Card + Best Present Ever!